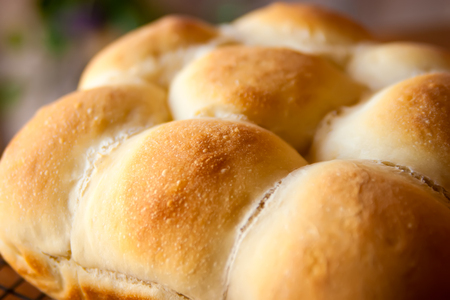 There are fewer things better than fresh baked bread right out of the oven, which is often why visitors to upscale restaurants often end up getting their fill in just on the complimentary rolls. If you are among these bread lovers—and wouldn’t mind making your own—then you need to try these Manuka honey glazed pan rolls as soon as possible! For the dough: In a smaller saucepan, warm up the milk on low heat (you can use a microwave with a microwavable-safe bowl as well). Heat the milk to between 100 and 110 degrees Fahrenheit. Move the milk into a mixing bowl before adding 1 teaspoon of Manuka honey and the yeast. Let this sit for about 5 minutes—at which point the mixture should appear foamy. Add the rest of the Manuka honey, the egg, the vegetable oil (or butter), and the salt. Using a paddle attachment for your mixer, mix until the ingredients have blended. On a medium speed, gradually beat 3½ cups of your flour into the mixture until it is elastic and smooth, adding the rest of the flour if required. Note: Despite being sticky, the dough should start coming off the sides of your mixing bowl. Once the dough has blended, switch to a dough hook for your mixer, kneading for about 3 minutes. You can also transfer your dough onto a lightly floured, clean surface and then knead for about 5 minutes. Move the dough into a slightly greased mixing bowl and then cover it with a towel or plastic wrap, setting it in a warmer place (free of drafts) to let it rise for an hour or until it has doubled in size. Once the dough has risen all the way, punch it down using your fist. Divide your dough into 18 pieces of equal size, shaping each one into a ball. Then, use cooking spray to coat two square 8-inch baking pans. Set 9 dough balls into each pan and cover with a towel or plastic wrap, letting them rise in the same warm place for about 30 minutes or when they’ve doubled in size. Now, preheat your oven to 350 degrees Fahrenheit. For the glaze: Whisk the butter, the sugar, the egg white, and the Manuka honey together. Then, brush the glaze over your rolls once they’ve finished rising. Don’t be afraid to use all the glaze as well. Bake your rolls for around 20 minutes or until they’ve become golden brown. At that point, serve them fresh out of the oven or until they’ve cooled to room temperature. Enjoy your Manuka honey pan rolls!